This is a follow-up to my post on rest. I thought I would share the things that I consider self-care. It’s important to know what things recharge you so that you can replenish your energy. This is different for everyone based on temperament and preferences. I give myself permission to include self-care into my daily and weekly routine. This isn’t frivolous but needed recharge time. When I do this, I am a better wife, mom, friend, and counselor. Listening to favorite Music: I love a variety of music. Have worship music, pop music, country music, 80s music. What I choose depends on how I feel. Laying by the pool in hot weather. What is self-care for you?? I have to be honest but today I am exhausted. And not the I could go sleep exhausted but the my brain is not working well exhausted. You know, the kind of mental and emotional fatigue that just settles in and keeps you stuck…on the couch…watching Netflix…. We all have these times in life. 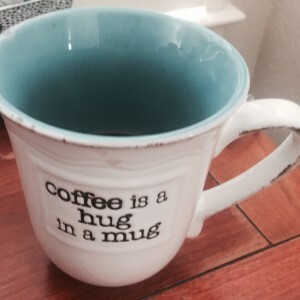 We’ve finished a big project, we burned the candle at both ends, our kids kept us up too late, stress is piling up, or we are dealing with strong emotions (panic, fear, anxiety, grief, trauma, or sadness). This is a life reality for all of us. None of us is super human; none of us can keep going and going and going without eventually burning out. Life is hard sometimes, if we are honest, life is hard a lot of times. So what do we do? 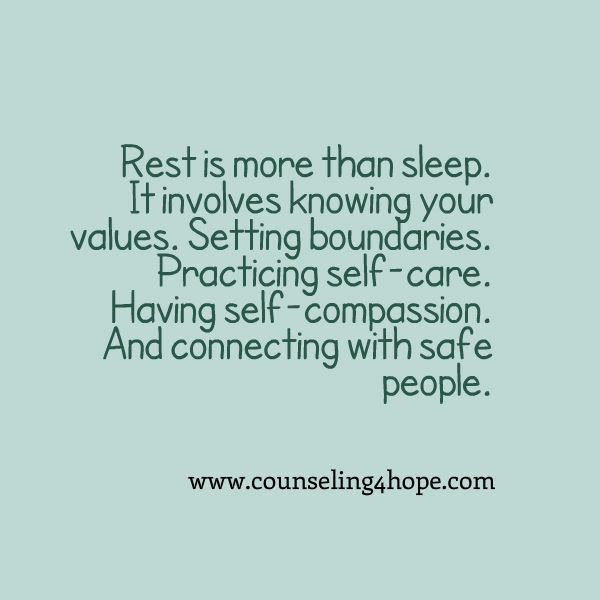 How can we manage the demands of our lives but find time to rest and recharge? Values: Knowing what is important and a priority in our life. So often we spend time and energy on things that really hold no value for us. Boundaries: Knowing our limits and being able to say no to things (even good things) of lesser value to us. Knowing our values can help guide how and when we set boundaries around our selves and our time. Self-Care: Making sure that we know the things we need to function healthily and what things are revitalizing and recharging for us. Taking care of our whole selves emotionally, mentally, physically, relationally, and spiritually. Self-Compassion: We are all imperfect and limited. Self-compassion is recognizing and accepting our limits without judging ourselves harshly. 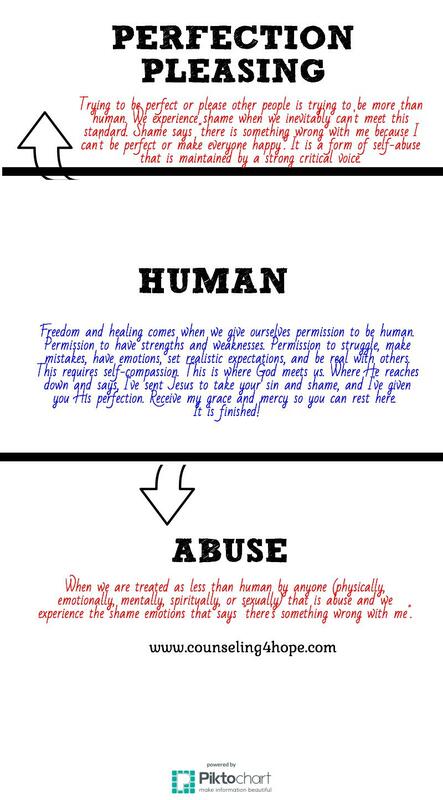 It’s giving our selves grace and permission to be human. Safe Mutual Connections: We are made for connection with other people. People who are aware of their own struggles and imperfections. People who accept us for who we are (warts and all). Spending time with people like this is refreshing. There is no judgment, just love, grace, and freedom. These are all ideas found throughout scripture and modeled by Jesus. 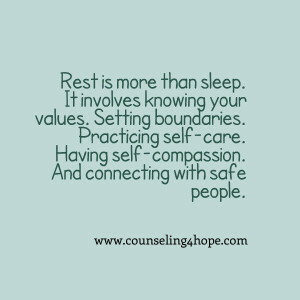 Maybe our Creator God knew how much we would need rest. Perhaps that is why He rested on day seven. Perhaps that is why he calls us to rest in Him. Perhaps that is why He initiates and draws us to Him. Perhaps that’s why He says “It is finished” (John 19:30).